Storms are lining up over the northern Pacific, on their way towards the northwestern United States and British Columbia. One of those may be associated with Hurricane Ana, and it would be seen early next week. The American Northwest should see the first substantial storm series of the winter season late this week, stretching out to early next week. Expect to see waves of drenching rain with some gusty wind along the northern eastern coast from California to Oregon, Washington State and up into Canada. One such storm with strong wind gusts is expected on Thursday, with a second coming on its heels Friday night and lasting into Saturday. Senior AccuWeather Meteorologist Bernie Rayno warns of possible flash flooding and mudslides dues to heavy coastal rain, ranging from 3 to 6 inches, with possibly more on the eastern slopes of coastal ranges, including the Olympic Mountains in northwestern Washington state. AccuWeather says the I-5 corridor on the lee side of the coastal ranges from Redding, California, through to Portland, Oregon, and Seattle, Washington State, may be affected, although rainfall will be much less than on the eastern slopes. 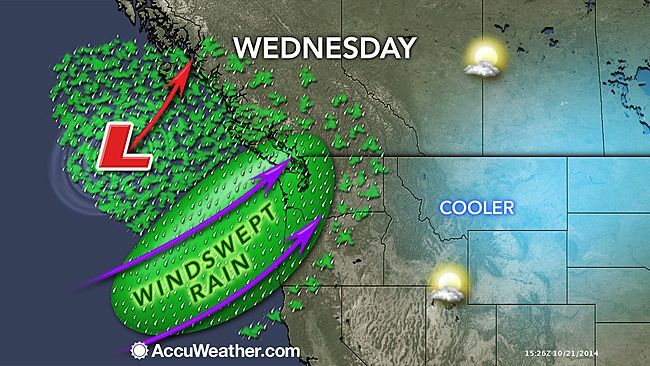 Victoria and Vancouver, British Columbia can expect soaking rains. Towards the southern end, baseball fans may get a soaking at the World Series games in San Francisco. Some areas will be looking forward to the rain, especially the drought-affected areas of northern California and southern Oregon. In the past few weeks, the U.S. Bureau of Reclamation reduced water flows out of Folsom and Nimbus dams into the American River, by 30%. They are trying to preserve the remaining cold water so it can be used in fall for the salmon run. This will put pressure on residential areas of Folsom, Roseville, and San Juan Water District if fall rains either don’t arrive or are too little. These coastal storms are not expected to help fill Folsom and Nimbus dams.